LONDON/JERUSALEM—Iran warned on Aug. 22 it would hit U.S. and Israeli targets if it were attacked by the United States after President Donald Trump’s security adviser said Washington would exert maximum pressure on Tehran going beyond economic sanctions. “Just to be clear, regime change in Iran is not American policy. But what we want is massive change in the regime’s behavior … We are going to do other things to put pressure on Iran as well, beyond economic sanctions.” He did not elaborate. 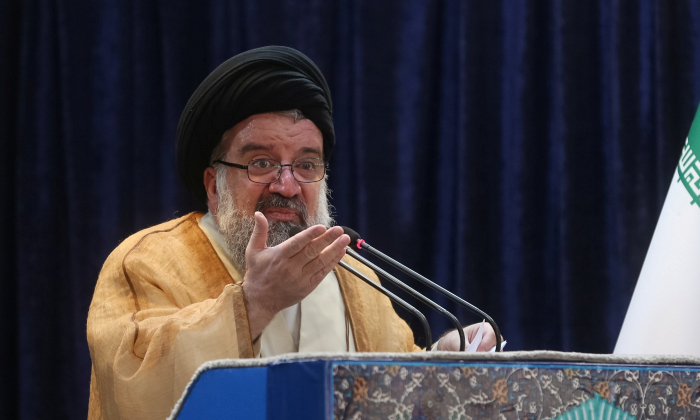 “They know if they harm this country and this state in the slightest way the United States and its main ally in the region, the Zionist regime (Israel), would be targeted,” Seyed Ahmad Khatami said. The Revolutionary Guards said on Aug. 22 they would continue increasing Iran’s defensive capabilities not surrender to U.S. pressure to scrap its ballistic missile program. Last week, Khamenei – who has the ultimate say on Iranian policy – said the United States would avoid outright conflict because of Iranian military might. “There will be no war…We have never started a war and they will not confront Iran militarily,” he said.